I have not filed my taxes. Yes, it's true. The Mormon money lady has procrastinated one of the things that one cannot (should not) avoid in this life. How about you? Have you been good girls and boys in getting your taxes filed this year? The IRS is making their list and checking it twice. They're gonna find out who has been naughty or nice. Is Tax Day really less than 2 weeks away already?? I usually get my tax info submitted to my accountant by February, but this year, oh, this year, I just haven't gotten around to WANTING to collect and categorize that information. After having the baby last year, I completely lost all sense of organization and forgot to record anything, which leaves 8 months unaccounted for. In addition, the labor and delivery did not go according to Plan A (or Plan B) (and Plan C was really expensive) leaving us with more accounts to keep track of. And on top of that, some of the medical bills arrived at our house many months after service was rendered, throwing us off and leaving us scrambling and pulling money from various savings accounts to pay them. We ended up paying a lot of medical bills which I now need to locate and sort into what got paid with FLEX (pre-tax money) and what got paid with savings (post-tax money). That sounds really fun, huh? So, how do I tidy up the disarray now? Clear off workspace in the office. 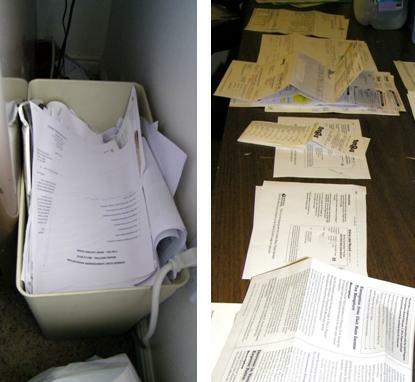 Empty out the trash can for for document shredding. Get all paperwork out. Receipts, invoices, statements, agreements, etc. Sort into categories: Medical, Business, Utilities, Pay Stubs, Internet/Communications, Charity, etc. Naah... That's it for today. My tolerance for this work is full. Next step, tomorrow!